​Ms. Osier wanted to create a series of Kahoot! quizzes to help her students review the material taught in Grade 11 Accounting. She had recently introduced Kahoot! to her class, and found it a simple and fun alternative to traditional review exercises. Using the textbook as a guide, we created one Kahoot! quiz for each chapter. Each of these quizzes contained about 15 to 20 low to medium-difficulty questions. We wanted to test the students’ knowledge of the content, but also challenge them to think outside the box. Ms. Osier’s second request involved revamping her Weebly site, which contained several broken links and slightly outdated content. First, we updated the theme of the site to achieve a cleaner and more professional look. Then, we reformatted certain sections that Ms. Osier felt were confusing or cluttered. This included renaming and reorganizing items in the drop-down menus, so that students are able to navigate more easily between pages. In addition, we looked for newer and more relevant videos to replace a few of the existing clips. Finally, we modified the layout of sub-pages so that all of the content from each unit is grouped together. Overall, our goal with the website was to make it very user-friendly, so that students are able to find exactly what they need, when they need it. We wanted the resource to have a very polished and academic feel to it, to ensure that Ms. Osier can have a strong online presence with her classes. To view the new and improved website, click here. Click here for a video tour of the Kahoot! quizzes. Click here for a video tour of Ms. Osier's website. 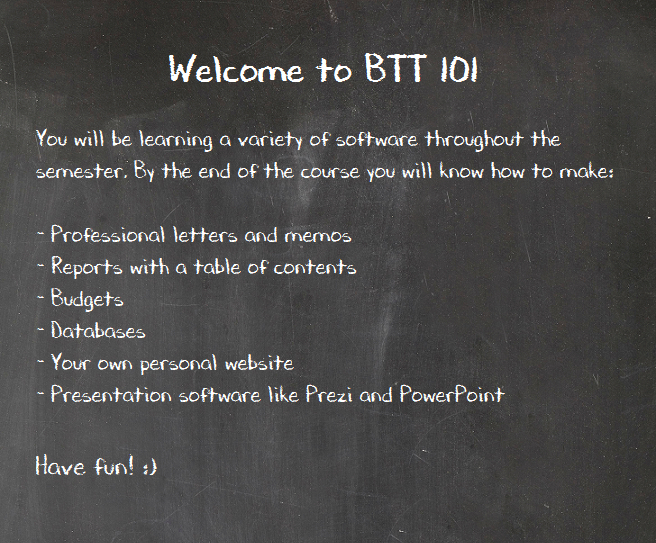 Chalkboard image that we created (using Photoshop) for the "BTT 101" page on the website. Weebly is ideal for teachers and students who are inexperienced with web design. It is very user-friendly, with all of the rudimentary functions of a website builder in the form of simple drag-and-drop options on the side of the screen. Weebly can be used by teachers to post assignments, announce homework, and provide links to online resources for any course. Additionally, most of the basic features on Weebly are free and can be accessed simply by creating an account. This makes it a great resource for a class that involves creating blogs, such as IDC, or having a space for each student to post their creations, such as an art or film course. To provide another example, an English teacher could use their Weebly site to post links to poetry slam videos, essay exemplars, and online versions of books. In general, Weebly can be used in any subject to provide students with access to information outside of the classroom. ​Kahoot! is a customizable, student-oriented studying resource. It is set up with simple question and answer boxes, which the user types into to make a new quiz. This ups the ease of the creation process, and many pre-made Kahoot! quizzes are available as well for a quick review activity. Teachers can use Kahoot! for almost any course, as it provides interactive, multiple choice assessments that can be tailored to a specific subject. These quizzes can be used to revise for an upcoming test, consolidate any learnt material, or simply act as a diagnostic test or a survey medium for students. For example, a biology teacher could use a Kahoot! quiz to assess a class’ knowledge of the respiratory system, and then focus on aspects of the lesson that the students are unfamiliar with. Alternatively, a History teacher could create a Kahoot! with one or two opinion-based questions, and then use the student responses to incite discussion or kick-start a lesson.